We're often blown away by the creativity of the entries in our annual recipe contest. Roxanne Chen's Matsutake Mini Muffins recipe is a perfect example of thinking outside the realm of the usual. Who would think to blend together matsutakes, seaweed, sesame oil, ginger root, and black pepper and come up with a muffin recipe? Well, Roxanne did, and the result is amazing. I developed them as a first course to accompany goose pâté for my annual New Year's Eve party. My husband and a friend are foragers and they had brought matsutakes back after a successful trip just before the 31st. I enjoy creating recipes from the produce I grow in my garden as well and love the challenge of a recipe contest. The mini muffins are the perfect accompaniment for salad, soup and chili, but they are also a welcome addition to an appetizer table. However, we think that they really deserve a very special place on the table. Bite into one of these little treasures, and you are greeted with a gigantic burst of flavor. After just one bite, you'll find yourself hovering over the remaining mini muffins, attempting to hoard them all for yourself. Yes, they really are that good! Matsutakes emerging from the forest floor! After narrowing down the many delicious-sounding entries, we ended up with a "Fab Five" to prepare, including Greg Fontenot's wonderful Cilantro Corn Cakes with Sauteed Mushrooms & Cumin Yogurt. His recipe was a favorite right from the start. What captured our attention about this submission? The flavors and textures run the gamut from the grainy cornmeal to the lime-accented mushrooms to the creamy Greek yogurt. And, simply put, it's unique and intriguing. 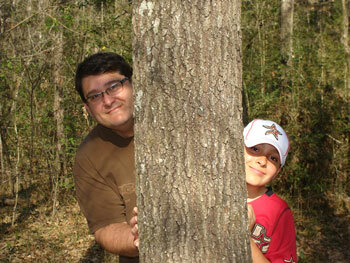 The camera caught Greg and his son, Kenneth, in a playful moment! ...And good riddance to 2012! 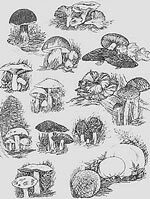 We say that with tongue only partly in cheek; 2012 was among the worst, if not THE worst, year we've had in our thirty-plus years of mushrooming. There. We've said it. Sure, we found some mushrooms, and sure, it was always interesting and absorbing to tromp around in the woods looking for them. 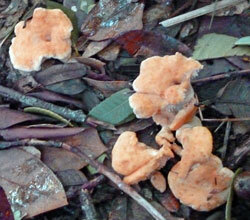 And we're willing to admit that the combination of some extended, non-fungal (but very fun!) travel, the lack of success we experienced on the forays we did go on, and - just perhaps - our own advancing years contributed to fewer hours spent in the pursuit of our quarry. 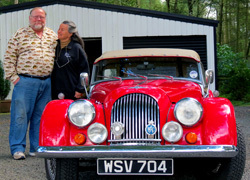 We rented a classic Morgan to tour Scotland! "Bad" years are never entirely bad, either. A little humility is never a bad thing for people who have fallen into the trap of thinking they're pretty darned good at any activity, mushrooming or otherwise. It also displeases the mushroom gods if they think they're being taken for granted. 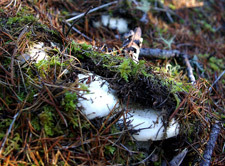 And perhaps the lack of the mushrooms we'd come to expect led us to pay more attention - not to gather, but to observe and enjoy - species we normally just pass by. And there were causes for minor celebrations along the way. One was the discovery of a small but worthwhile patch of candy caps, a lovely addition to our stores whenever we can get them. They were the direct result of a "lead" by Eve and Stephen Thompson, and the celebration of a nice find is made even better when it's directly attributable to really good friends. I should add that this was a "lead" in the sense that they practically took us by the hand, led us directly to the candy caps, pointed at them, and said "There they are!," then stood by while we cut and bagged them. That, dear reader, is a lead! Then there was the day Mary came home from a solo foray (I was in the midst of a project, and couldn't join her) bearing a beautifully crisp Cauliflower mushroom, which is always a cause of celebration. 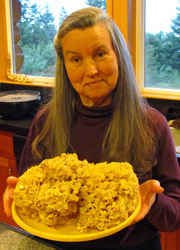 She earned the title of "Mushroom Queen" that day; she often does. Friends Eve and Steve cornered a beautiful grouping of absolutely perfect Amanita muscaria just as they were popping out of the ground, and we watched them grow into astonishingly beautiful maturity, and then into their inevitable decay. Steve is a very fine photographer, and chronicled their lives. 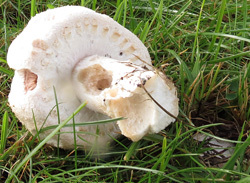 By the time those Amanitas were gone, they were like old friends, and we found ourselves mourning them, in a way. There were also the days that we headed out together, filled with the heady anticipation that this would surely be our day: conditions were right, the weather had changed for the better and our season was about to take a dramatic turn for the better. They never turned out that way this year, but sharing days like that with somebody you care about certainly lessens the disappointment when things don't work out exactly as planned. upon this specimen in Scotland. There were a few other highlights, too: a fungal photography class in June put on by Steve Trudell, long-time professor of mushroomy stuff and esteemed co-author of Mushrooms of the Pacific Northwest, a must-have for anyone seriously interested in the subject. We've known Steve for years, have taken classes from him before, and always - always - learn a lot from him. And in October, we had the pleasure of seeing the latest performance (they're way too good to be called "shows") by Taylor Lockwood, the best (and most widely-travelled) mushroom photographer on the planet. Taylor is a born entertainer as well as a good friend. He never fails to surprise and delight, both in person as well as through his videos, calendars and books. It's funny, in a way. As I review what I've written above, I find myself thinking, "Shame on you; here you are, whining and complaining about what a lousy year it was. It was actually a great year - just different!" And with that thought, we wish you a bounteous and rewarding 2013, in every sense of the word! 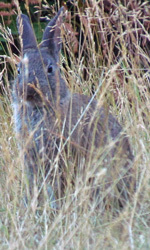 A cottontail thinks I can't see her. Like so many people, especially those of us who are still clinging to our New Year's Resolutions to eat more healthy and to be more fit, we're always on the lookout for a way to lighten up favorite foods without lightening up flavor. With that in mind, Healthy Cooking's revision to Julie Stack's great-grandmother's recipe for stuffed chicken breast with mushroom sauce in their October-November 2012 issue caught our attention. We couldn't resist the temptation to see if the makeover would live up to our flavor expectations. Our judgement call: quite a nice, easy preparation that fills the bill when you're longing for comfort food. Why not give the recipe a try and let us know your thoughts! We found these tiny treasures growing in a thick bed of oak leaves.